Great analysis, thank you for sharing. I’ll probably look somewhat similar but I would not reduce my Dutch share count. The way America is running on debt and looming crisis I think it’s a positive to have a larger part in non-US stocks. If America gets into a crisis it would probably hit non-US stocks just as hard, because of the effect on world trade. I also doubt if debts is just an issue for America. If I look at the Dutch housing market these days, where prices are increasing fast and where it’s now even normal to place bids above the asking price, it also looks like we are back at the years just before the financial crisis. Debt as percentage GDP of the Dutch government is also still well above the pre financial crisis level. Although it’s declining fast last few years. In my eyes heaving debts is not a problem if the underlying economy is strong enough to generate enough cashflow to pay the interest and as long as there are enough investors to offer the money. Cool analysis! 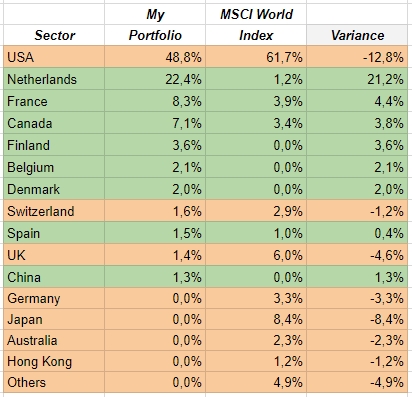 I was trying to determine my portfolio’s revenue by country of origin last week. I couldn’t figure out an easy way to do it. Nice job!